I have a Crouse Hinds 2 pole 30 amp breaker. It will trip, but the room it's to will still have power to it. Why? I recently purchased a house, and it is clear that the previous owner had not always done things correctly. My present concern is that there seems to be 14 gauge wire running off a 20 AMP breaker. I believe this is a code violation, and more importantly a fire risk. I would rather not open up the walls to replace the wire. Assuming the circuit would be OK on a 15, can I just have the breaker replaced? Is that an adequate solution? Yes, that is a code violation and a fire risk. And it invalidates the insurance. 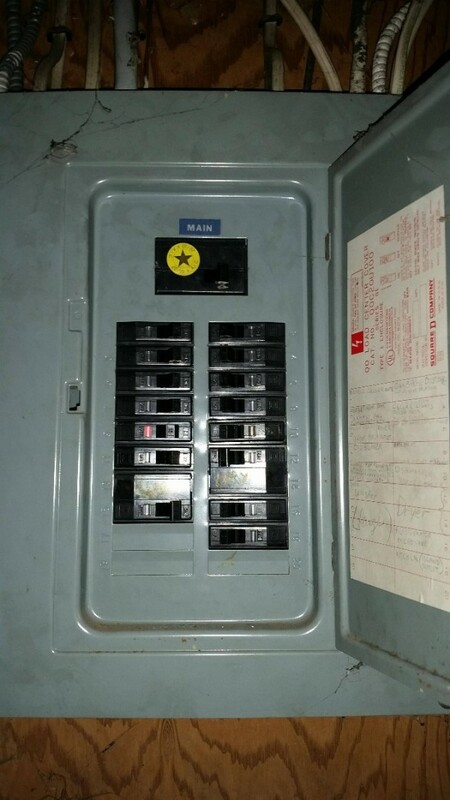 2) turn the 20 Amp breaker off and pull it out. 7) turn the 15 Amp breaker on and test the appliances or outlets that are fed from it. If you forget point 4), there will be scary sounding arcing and sparking that could startle you into falling off your ladder or chair. The guy I'm buying my double wide from just hooked up a fairly new furnace. It will run for like 6 to 20 minutes, then the breaker will kick off. The breaker does get warm. Is the breaker going bad or is there something else that he did wrong? Since you did not buy this yet, have the seller fix it. While you are at it, test all the plumbing and look for anything else that needs fixing. We did this when we bought our home. We once had a furnace in a mobile home that reacted the same way. The problem turned out to be a loose connection at the breaker. This happens in some of the older mobile homes that were built using aluminum wiring. I turned off the breaker to install a new light. After making my connection the light came on. I checked and the breaker was still off, what happened? Odd. Double check that it clicks back and forth completely. If you still have issues, you may want to contact an electrician to check it out. Post back with an update! The power points down one side of my house stopped working so I checked the switch board and found one of the circuit breakers in the off position. I turned it off and unplugged every power point and the offending breaker would not reset. Then I turned off the mains and I could reset the breaker, however once the power was turned back on it tripped out again. Does this mean that one of the power points needs to be replaced? The house is 25 years old. If you dont know what you are doing consult an electrician. If you do it incorrectly and you have a fire, your insurance will not pay. I have a wire that comes out of the junction box in the basement that works for 3 rooms on the second floor. When hooked up, the breaker blows. However when testing ceiling lights and outlets they show power going to them, but they won't work? After removing all the bulbs, now when the wire is hooked up, it shows power to everything and the breaker stays on, but nothing works. Could it be the breaker or something not grounded? This just happened suddenly in the middle of the night. Your breaker might have gotten damaged when something happened in the middle of the night. When the circuit blows, that is the safety feature that prevents fires. I would get a qualified electrician to fix this. If you do it incorrectly and you have a fire, insurance wont pay. I plugged in a vacuum cleaner in the living room and had other things going (TV, etc.) and blew the circuit. I unplugged everything and tried to re-set the circuit breaker (switch to off then back to on position). However, the switch will not switch completely to the off or on position. I can move the switch in either direction, but not enough for it to stay there. It goes right back to the middle. Can someone tell me if there is anything else I can try, or does thia mean I have to pay to have an electrician come in and repair this? Many thanks in advance! Sounds like the circuit breaker has died. They are available at hardware and building supply stores. 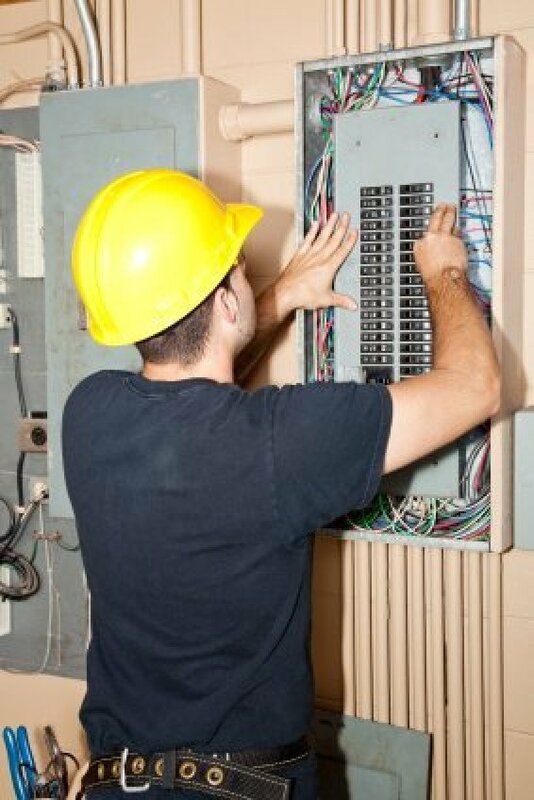 To change a circuit breaker, turn off the main breaker on top. Then, with the largest flat screwdriver, that just fits into the slot on the screw, that attaches the wire to the breaker, loosen that screw, but don't remove it. Just loosen it and pull the wire out, but not too far away. Then use the flat screwdriver to tilt the dead breaker back, away from the center. Then it's easy to pull it out. With the dead breaker in hand, go to the hardware store and buy a replacement 15 (fifteen) Amp breaker. Do NOT get one with a higher rating! Then shove that new breaker into the slot in the panel, and after making 100% sure that the main breaker is off, attach the old wire to it. Then, with the largest flat screwdriver, that just fits into the slot on the screw, tighten that screw until you hear it squeak. Turn the main breaker on and turn the new breaker on, and everything will be fine. before you have tightened it enough. Call your electrician!! It is easier and a whole lot safer, speaking from experience!! I had this happen to me, only it was the main breaker, so I called the electric compnay. I paid $50 to see a guy stand on a step ladder and push it really hard. I was embarrassed and then mad because that costed me $50!! 1 - Can I turn the main switch back on after the faulty circuit has been removed (so the family can still watch TV while I run to the hardware store)? 2 - If I have a circuit breaker, that is the same model as many of the others, but has lost most of its tension by comparison (it still holds its place in the on and off position, but it takes the slightest nudge to move it), does that infer it is going bad and needs to be replaced? 3 - I had a short blow out an overhead light fixture badly enough to melt the plastic and make the wires brittle. This did not blow the breaker...is this a problem, or are fixtures too small a draw to flip the circuit? I was advised by someone who knows that if a breaker goes bad, and one elects to replace it himself, that a breaker of the same make and model is the best bet. Evidently there are differences. My own problem was something that I did not want to handle and I called a licensed electrician to handle. Good luck! The circuit breakers in all my four bedrooms are tripped and cannot be switched on, but the bathrooms are OK. I don't think the breakers are bad or the circuits are shorted because they are individual, and cannot all be bad at the same time. Make sure there is absolutely nothing plugged into any of the outlets in the bedrooms. Something - a lamp, clock, etc. could have a short and will prevent the circuit breaker from resetting. Even a dented or cut electrical cord can do this. Also make sure none of the overhead lights are turned on. Check the light bulbs in them because even a bad light blub in one of them can cause a short. I spent 27 years working on computers and our rule was "check the easy stuff first". If each room is on a different circuit check each room individually. Eventually you will track down the culprit. Happy hunting and good luck. I'm trying to figure out why breaker won't reset after overloading the circuit with space heaters. I even replaced the breaker and it sparked when I tried to reset. I'm planning on checking plugs next to see if the wiring is damaged. Is this a good place to start? My boat's 30amp circuit breaker opens when I first plug it into shore power. I may have to reset the breaker a few times and then it works even with a 15 amp heater load. What should I look for? I put in a new breaker box, but all my power is not right. Some of it is weak and sometimes dims and comes back. I cleaned my Whirlpool oven with Easy Off and it was heating up even when it was off. After I cleaned I dried it and waited a while before turning it on and it flipped the breaker and now does nothing. The breaker won't reset. I turned the breaker to my water heater off and when I turned it back on my water heater wasn't working. As it is a very old water heater I thought it had gone out, so I replaced it with a new one. It is still not working. The plumber installed it correctly, we filled it, and turned the breaker on, nothing. The plumber checked the plug going into the hot water heater and it reads 110 on each side because it's a 220 plug. The last water heater we had was 220v 3800w 150 PSI, 30 gallon. This water heater is 240v 4200w. I have two questions. Would the wire test 110 on each side at the water heater if the breaker was messed up? Does the voltage make a huge difference being the old one was 220 and this one is 240? I changed all the outlets in my house from two to three prongs. Within a week my son's room lost power. I checked the breaker and reset all GFCIS, but nothing. I then I bought a multimeter; it revealed that the lower pole out of a two pole breaker was dead (this was the only breaker dead in the box). I did buy a new 20 dual pole BR type breaker and replaced it, but there is still no power, in fact the lower pole is not giving me a reading just like the old one. What can be the problem now? I have a circuit breaker that tripped last week. The backyard lights and dinning room light run off it and everything was off when it tripped. It would not reset even after pushing it all the way to off. I thought maybe it overheated so I left it off over night, but then the next day it still did not reset. I waited until today when I am off work to go to Home Depot to by a new breaker and see if that was the problem. As I was getting ready to leave, I decided to test the breaker again just in case and lo and behold it reset and everything works just fine again. What would cause a breaker to not want to reset for several days? We have been experiencing a "hot" smell whenever we use the clothes dryer. We have cleaned all possible lint and dust from the dryer and the vent to make sure that was not the source. New notice the smell coming from the circuit breaker panel, any thoughts? Question: Short in Circuit, Bad Breaker, or Floating Neutral? I asked an electrician to fix the circuit breaker in my house because it was tripping. So he connected 4mm wire between the neutral and the earth. All was well for 2 days, then it kept tripping whenever you pull out the wire. What could be the problem? Could it be a floating neutral? I don't know that much about electricity, but call the electrician back to fix the problem. They are supposed to guarantee their work. I just moved into a new house a couple of weeks ago. It was pre-wired for cable. I had my cable installed last week. Ever since they installed the cable my breaker for my bedroom is tripping intermittently. I had the electrician at my house. He said unless something happens when he is there he cannot find the problem. Is there anything I can do on my own to try and solve this problem? I had it trip 3 times this morning and it is getting very frustrating! My first guess would be you have more than your bedroom on that breaker and the cable box is drawing just enough to make the breaker trip when something else turns on,especially a motor such as a furnce blower. Try turning off the breaker and see what else doesn't work besides the bedroom. Otherwise it has to somehow be connected to the installation. Did the installer add straps and drive a nail or screw into a wire causing an occasional short. If it is a new construction house, the pre-wiring for cable may have been improperly installed but not actually tested until you had the cable service hooked up. That is, if the cable and electrical wires were installed running together in your bedroom, and a nail or staple or other problem inadvertantly connected a conductor in the electrical cable with a conductor in the TV cable (especially the grounded shield), it could have been OK until the cable company connected their service. This is similar to the possible reason in the first responder's post. We recently purchased an old home (105 years old) and one day half of the lights on a circuit stopped working. They stopped when I turned on a sconce and it shorted and blew the circuit breaker. Half the lights on the circuit went out, not to be seen again. I have checked all of the old outlets and replaced them as I thought I might be shorting back through the common. I am stumped as to what I should do. I had an electrician come out and take a look and he is stumped as well. Any advice? One of the ancient wires or connections blew faster than the breaker. You need a "tracer". That is a tool that you can get at electrical wholesalers and tool suppliers for tradesmen. It emits a tone when it is near a cable under power. You just follow along the cable, guided by the tone. Where the tone stops, that's where the break in the wire is. Don't be tempted to just bypass that section. Dig it out and repair it properly. Otherwise, an intermittent contact could make contact again during a storm or any slight movement of the house and could cause it to burn down. I had the same type of thing happen to my home. It turned out to be the ground wire had melted. The old homes used aluminum and with todays load it is common for it to melt and break away if something causes a short. The electrician I had come out was resently repairing all the schools in our area with the same problem due to overloads in the classrooms now with computers and such. Anyway his solution was to put a grounding rod (lighting rod) and ground the entire home to the rod. Ask your electrician of this posability. Every time I turn the 20 amp breaker on it trips back off, I am wondering if it's the breaker or a short. My recessed lights in my home's ceiling trip the breaker only when the temperature is a little colder inside the house. The only thing on the circuit is the lights in my family room, hallway, laundry room, upstairs steps light, and the guest bedroom. We have had the house two years and had no problem until now. Here are some clues I have discovered. After resetting the breaker the small light on the steps will work, but when I turn on any other light on the circuit it trips. After several hours and the temperature rises in the house the lights work no problem. it seemed to start when we had the painters in and the light switch covers were taken off. But even when they were still off later in the day when the temperature went up they worked again. While experiencing breaker tripping, I disconnected each switch to see if there was a bad switch, but no luck the breaker would still trip. The only thing left I can think of is a bad breaker, but I have never heard of one being sensitive to cold temperatures. Any ideas?